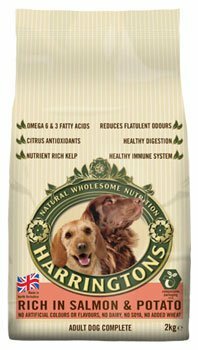 Harringtons seem to have suddenly appeared from nowhere with their offering for dogs, but apparently they've been in the milling business for several generations. The food is made in their Thirsk factory. 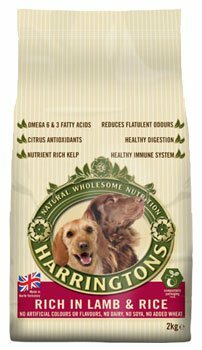 What you get with Harringtons is a fairly standard 'natural' product which uses as its cereals a mix of maize, oats and rice, with protein of 21% and it is naturally preserved. Formulation does seem to have altered recently with maize becoming the biggest ingredient, which might indicate that costs have been considered to keep the price steady. Harringtons offer a good product, but with one basic criticism. Most premium natural foods try and keep to one named protein source. Harringtons include with their main named meat another un-named meat meal - which is possibly to keep costs down, but is a shame. There's also poutry fat in the recipes which, although not generally a problem does not match the meat or fish used. It may not matter to your dog, but to an owner with a pet that sufferes from sensitivity to ingredients, it might put them off purchasing. Maize, Lamb Meat Meal (14%), Barley, Rice (14%) Meat Meal, Beet Pulp, Poultry Fat, Digest, Linseed, Minerals, Kelp (0.2%), Yeast (0.1%), Citrus Extract (0.04%) & Yucca Extract (0.01%). Additives (Per Kg): Nutritional Additives: Vitamin A 15,500 iu, Vitamin D3 1,350 iu, Vitamin E (alpha tocopherol acetate) 165 mg, Vitamin C (ascorbyl monophosphate) 50 mg, Iron lll Ferric Oxide 805 mg, Calcium Iodate Anhydrous 3 mg, Cupric Sulphate Pentahydrate 40 mg, Manganous Oxide 80 mg, Zinc Oxide 55 mg, Zinc Chelate 400 mg, Sodium Selenite 0.2 mg. Antioxidant (contains tocopherol rich extracts - a natural antioxidant). Composition: Maize, Salmon Meal (14%), Potato (14%), Meat Meal, Barley, Rice, Poultry Fat, Digest, Linseed, Beet Pulp, Minerals, Kelp (0.2%), Yeast (0.1%), Citrus Extract (0.04%), Yucca Extract (0.01%). Additives (Per Kg): Nutritional Additives: Vitamin A 15,500 iu, Vitamin D3 1,350 iu, Vitamin E (alpha tocopherol acetate) 165 mg, Vitamin C (ascorbyl monophosphate) 50 mg, Iron III Ferric Oxide 170 mg, Calcium Iodate Anhydrous 3 mg, Cupric Sulphate Pentahydrate 40 mg, Manganous Oxide 80 mg, Zinc Oxide 55 mg, Zinc Chelate 400 mg, Sodium Selenite 0.2 mg. Antioxidant (contains tocopherol rich extracts - a natural antioxidant).